Mannington Hardwood floors are a natural wood product, factory finished and engineered for superior performance. 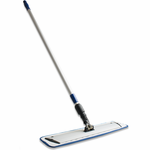 To properly maintain your Mannington wood flooring, sweep or vacuum regularly with a soft brush vacuum head (and never use a beater bar) to remove loose dirt and debris, remove spills promptly and clean routinely with Mannington Ultra Clean. Never wet mop or flood your floor. Do not use oil soaps, liquid or paste wax products or other household cleaners that contain lemon oil, tung oil or ammonia. Protect wood floors with masonite or other hard boards when moving heavy furniture or appliances. Use wide-bearing, non-staining floor protectors on furniture. Use non-staining doormats at exterior entrances to prevent loose dirt and debris, as well as asphalt and driveway sealer, from tracking inside. Remove shoes with spiked or damaged heels before walking on the floor. 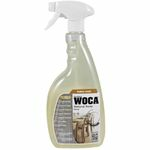 For Mannington True Bamboo� ONLY use Woca Wood Soap spray for everyday maintenance instead of Mannington UltraClean. Mannington has partnered with 1877floorguy.com to provide you with Mannington recommended floor care products when you are unable to find them at your local Mannington Retailer. © 2018 Mannington Mills, Inc. All Rights Reserved.